Vija Celmins taps into old sources and childhood memories as she continues to simultaneously explore the intimate and the cosmic. 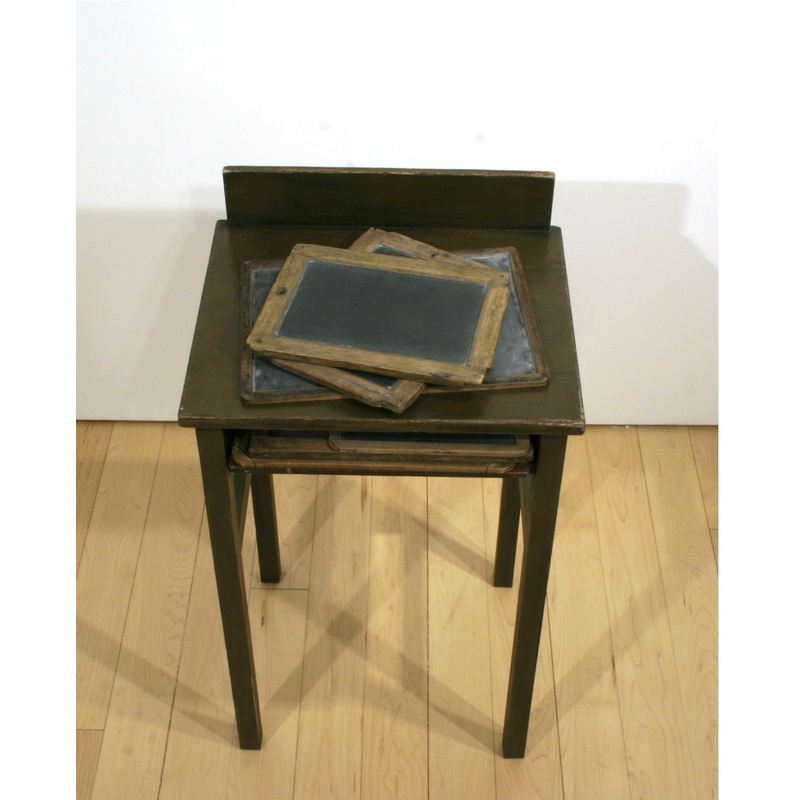 Vija Celmins, "Table with Tablets," 2008-10, table: wood and acrylic 6 found tablets 1 made tablet: wood, acrylic, alkyd oil, and pastel 33 x 18 1/4 x 14 3/4"
Vija Celmins, "Balckboard Tableau," 2007-10, 3 found tablets, 7 made tablets wood, paper, string, acrylic, alkyd oil, and pastel 17 1/4 x 70 1/4 x 2"
Celmins:When I did the first casting of the little slate tablets five or six years ago, I realized that it was quite close to the black paintings, except that instead of an artist's made surface, its surface was already made by school kids and time. Beautiful black grays made by someone else. Rail: When did it all begin and what attracted you to the objects? Celmins: Well, I began to collect them in Sag Harbor, where I have a little house, as early as the late 1980s. I liked them because they had a feeling of where I came from in my childhood in Latvia. This show seems to have a narrative, but it's just not that clear what kind of narrative it really is. This work is about looking, like an invitation to look. I asked my friend, Ed Finnegan, to make a couple of those tablets as close to the original as possible so I can paint on them afterward. I think "the art part in the art" as de Kooning once said, is maybe only about five percent of a work. I sort of re-described this little tablet and my whole energy and power of invention are in making it as thorough as I can, and then there's this sort of childish delight afterwards that I have done it. That I've put them together and you have to really look, look, look, and then you say, oh, she's made this one. For me it's not so easy to jack yourself up to do the work. Especially when you're just over 70, as I am now. And I have all these memories in my head and all of these things that I have to take care of, and all of the books that I want to read. To bring myself, then, up to that level of devotion that making work is, it's sometimes hard to be inspired. There's a time when you are in your 20s and maybe in your early 30s when the whole idea of making something is so much of a fire in you and then you make these friendships and you look at each other's art. I often think that's such a wonderful time. I wish I'd had more camaraderie instead of feeling a little more isolated than I did. But now I don't even think about it one way or another, because now I realize we're all sort of alone. I just don't think there's an avant-garde or movement anymore. It's relatively grim in the art world. It's every man for himself, but at the same time full of wonderful surprises. As for my work, which is not that entertaining, or about entertainment, the one thing that I always wish to have is my small handprint, so that it would be considered one gesture from one human being to another. Rail: About the night sky paintings, I always wanted to ask you, with all of the subtleties of gray tones embedded in the white stars and the black sky, how do you build up the surface while controlling the balance of tones? 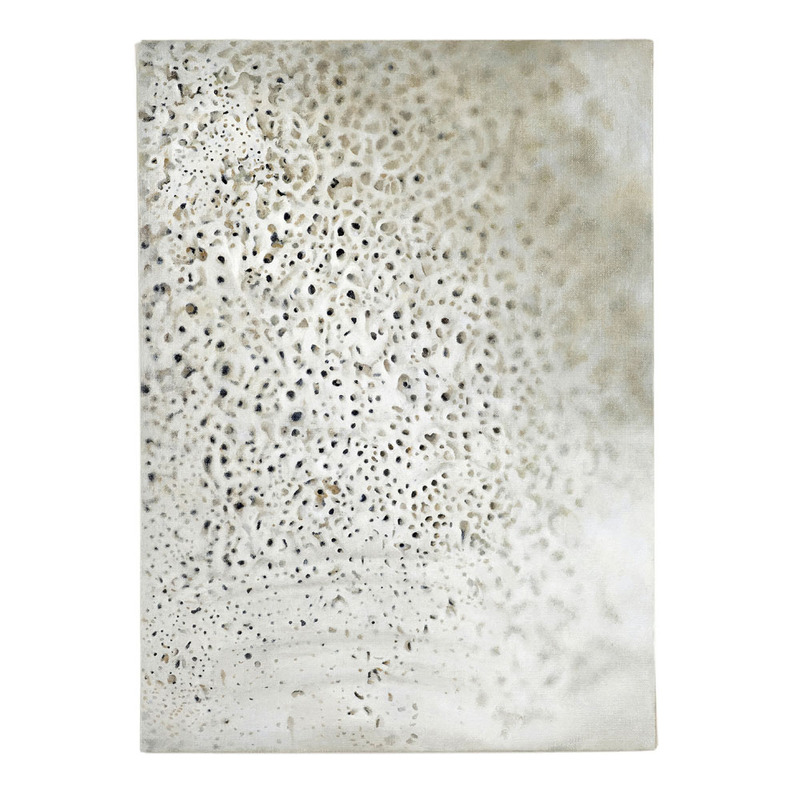 Celmins: Well, the rather boring technique is this: what I do is I first draw in a pattern that breaks the surface, and then I draw the different sizes of circles for the stars. Next, with a small sable brush, I apply a tiny drop of liquid rubber; it hardens and I build up to a desirable thickness. I then paint different layers of ivory blacks that have been mixed with burnt umber, ultramarine blue, and sometimes with a bit of white. And I use alkyd, which takes about two days to dry, and once it's dry, I then take off the little rubber bumps, which create those little holes with various kinds of white, which is mixed with a little bit of cerulean blue, and sometimes with raw umber or yellow ochre. Rail: What kind of white? Celmins: A combination of titanium and zinc white. And I keep filling those holes until they come up to the same level as the black surface. 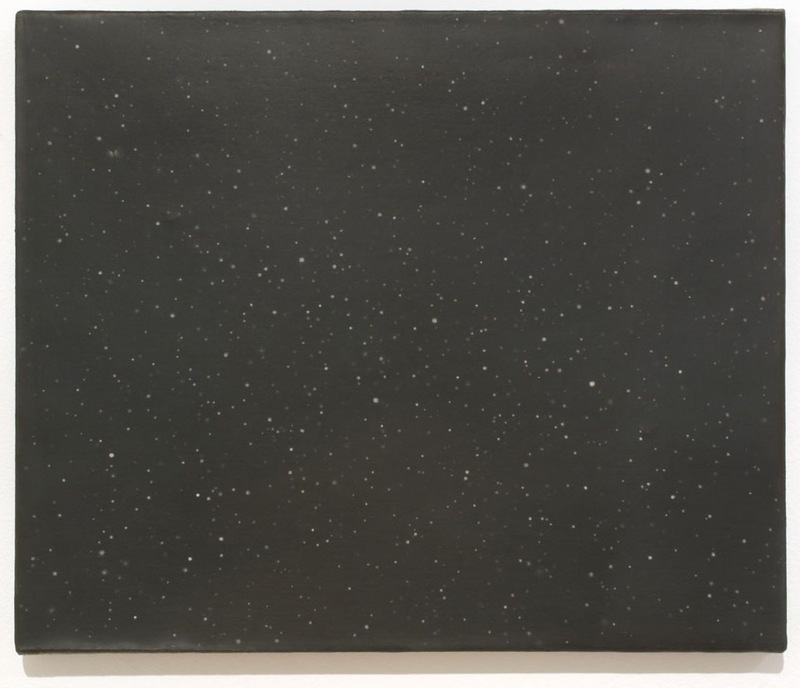 Celmins: And I often sand it a little, so that the whole surface is totally uniform, flat, and has very tight skin. 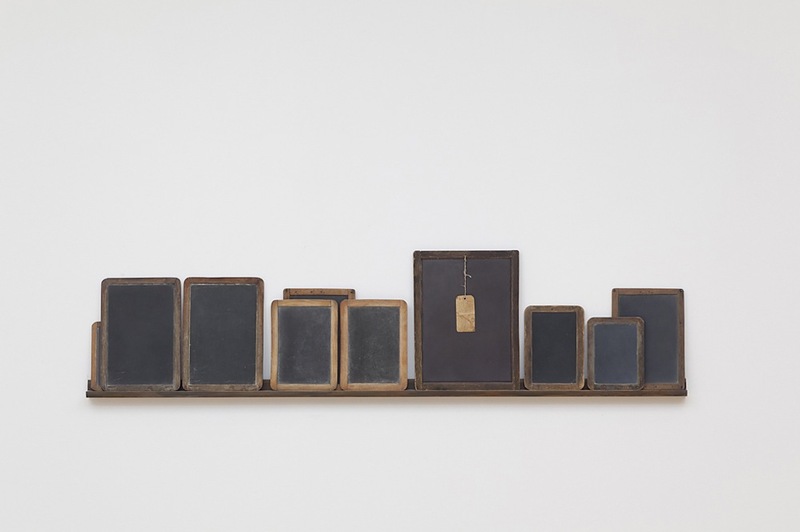 "Vija Celmins: New Paintings, Objects, and Prints," David McKee Gallery, New York, NY Through June 25, 2010.